Zombie Scars Two Wounds.Includes: Two Wounds Accessories. Available Size: One Size Fits Most Adults and Teens. *Costume and Accessories Not Included. Sold Separately. 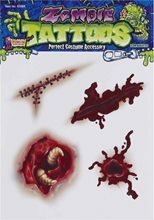 Complete your Zombie Bloody Costume with Zombie Bloody Scars - Two Wounds Accessory. Amazing Product! Try it. 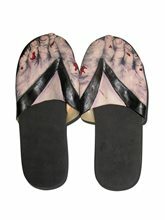 Zombie Scars Three Wounds.Includes: Three Wound Accessories.Available Size: One Size Fits Most Adults and Teens. *Costume, Makeup, Adhesive, Adhesive Remover and Blood Not Included. Sold Separately. Complete your Zombie Bloody Costume with Zombie Bloody Scars - 3 Wounds Accessory. Amazing Product! Try it. Zombie Nail Polish and Lipstick Set.Includes: One Zombie Nail Polish and Lipstick. *Costume and Accessories Not Included. Sold Separately. The zombie apocalypse may rush upon you like an infectious dust storm, but that is no reason why you should go out to quench your hunger for human flesh without our Zombie Nail Polish and Lipstick. A makeup set is a fashion necessity for any respectable zombie terrorizing the streets in a near-mindless state. This makeup kit includes a tube of grey lipstick and a bottle of grey nail polish. Grey nails and lips are the new trend in today's modern zombie era and is an essential accessory for completing your women's zombie costume for a look that others are sure to die for! 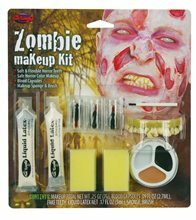 Zombie Makeup Kit.Includes: Rotten fake teeth, horror color makeup wheel with three colors, cherry flavored liquid blood capsule, two makeup sponges, small applicator brush, scary skin and step by step instructions. *Costume and Accessories Not Included. Sold Separately. Complete your zombie costume with this awesome Zombie Makeup Kit! It'll give you that authentic look you've been looking for! Zombie Grey Tube Makeup.Includes: One Zombie Grey Tube Makeup. *Costume and Accessories Not Included. Sold Separately. If you're looking to brush up on your gory Zombie complexion, then this tube of grey makeup is just what you need to give you that eerie rigor mortis look. Zombie Green Ooze.Includes: One Tube of Zombie Green Ooze. Available Size: One Size Fits Most Adults and Teens. *Costume and Accessories Not Included. Sold Separately.Complete your zombie costume with this awesome Zombie Green Ooze! Zombie Skin Flesh Makeup.Includes: One Zombie Skin Flesh Makeup. *Costume and Accessories Not Included. Sold Separately. Zombie Gory Flesh, for that chunky flap of skin look. Add a little blood gel behind the torn flesh for a really gory look.